I have been meaning to write about a new(ish) range from Waitrose that goes by the name "Pure". It popped back into my mind because I have seen green bloggers asking for advice on whether it lives up to the name. Simple answer is NO. From where I am looking, a couple of the products (face polish & beauty balm) are free from recognisable synthetics but the rest of the range makes me cringe. Look closely and you'll find Dimethicone, Methylchloroisothiazolinone (MCI), Methylisothiazolinone (MI), Sodium Laureth Sulfate and Cocamidopropyl Betaine, to name a few. Alarm bells goes off in my head when I see MCI/MI, these are controversial ingredients which Dermatologists are linking to the rise in allergic reactions and want banned. Yes, you read that correctly and get this, Pure is marketed as "Natural care for Sensitive Skin". If only you could see my face whilst typing, it ain't smiling! I think ingredient quality has been compromised for price (average cost £1.99/£2.99). Depending on which product you look at there is a percentage claim of naturally derived ingredients (somewhere between 90 - 100%). Ingredients like Cocamide DEA are chemically modified from nature (in this case coconut oil) so yes you can say “naturally derived” but I would not exactly call it "pure". Of course, it's not all bad, there are some familiar natural ingredients across the range (e.g. shea butter, olive oil & almond oil). I say that with gritted teeth because the rest of the ingredients are not in the least bit appealing to me. Full ingredients are available on Waitrose website for your viewing pleasure. 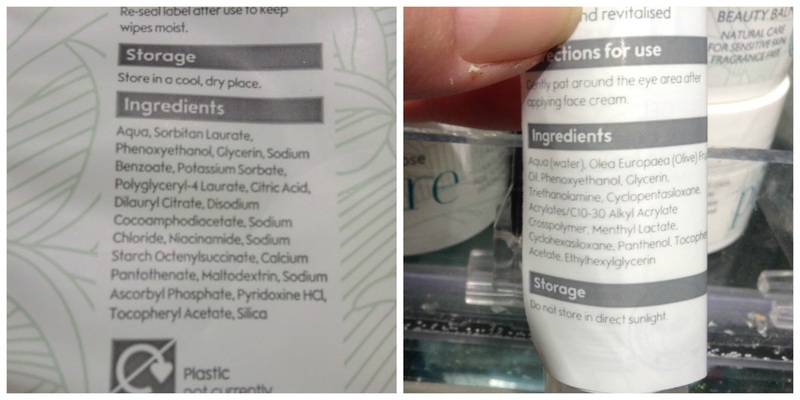 If ingredients do not concern you then head down to your nearest store but if you have sensitive skin be selective about the products you purchase. I hate it when a brand markets something for sensitive skin and it contains things like sulfates! They would wreck my skin. I feel like a snob saying this but I would avoid anything in that price bracket as I know cheap products just wouldn't work for me. Waitrose should know better! They sell a whole range of natural brands so they should know what they should/shouldn't be using in their own "natural" range. Just looking at the photo of the wet wipes is making me shudder! I agree, I do enjoy browsing the rest of the beauty department, I think the logic behind this range could possibly be more about price rather than ingredients and I find that disappointing. I think its crazy that Waitrose have done this because they are known for being quite an expensive brand (or at least higher than other supermarkets) and have customers that are willing to spend more so it would have been nice to see them actually produce truly natural products but with a higher price tag. I would expect to see £1.59 face wipes and £1.99 oil in Asda for crying out loud!! I spotted the hair care the other day, that's a new addition to the range. I always use Waitrose when I get an emergency situation because they have better brands so as you girls says I too expected better. I got so excited when I first saw this a couple of months ago, and then so disappointed when I turned it around to read the back. Normally I would have just assumed it would be rubbish at first glance, but as Waitrose have been stocking more and more green brands there was a glimmer of hope - that of course was quickly crushed into tiny little pieces! I did exactly the same as you and then wonder how do you make a clear face oil when all mine are orange in colour?